Flavored with spiced. Semi-sweet, and rich fruit aroma. Like this one a lot. It's got a lovely clove-ginger hint to it, but with a nice sour punch. Nice spiced cider. Not too sweet. 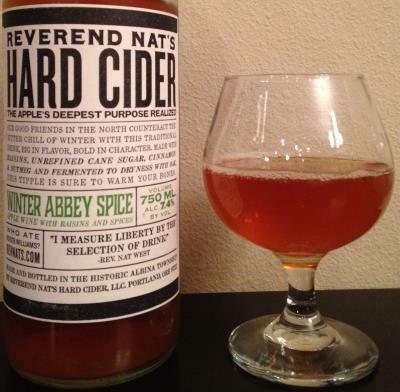 This is a New England Style cider fermented with cane sugar, raisins, cinnamon, nutmeg, and oak (aged 6 months). Lovely rich flavor with lots of caramel and brown sugar. I pick up the raisins more in the scent. The spices remain mild to moderate. The oak is barely discernible. However, I wasn't a big fan of the sourness...at first I thought it was a spice, as it presented a bit odd and wasn't extreme, but it was present nonetheless, and something I'm not a fan of. Not too expensive for a craft cider either at $13 for 750ml. Winter seasonal.